1. The family of Jackson and Juliet. They have a total of 10 children – 12 to 26. · Ester – will be in S-5 in Kampala, January of 2016. 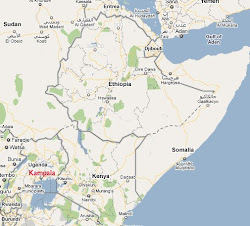 · Peace – will be in S-4 in Kampala, January of 2016. · Robina, the oldest in the family, is completing YWCA hotel Management. · Rita, Noume and Shallon all live at home near a remote village near Kinoni and attend/walk to primary school – about 3 miles each way. 2. The family of Godfrey has three children that we would like to assist. · Joyce is 16, Enoch is 14 and Raymond is 12. Godfrey's two sons and his niece will complete P-7 at Ibanda Primary School in December of this year. They all want to start S-1 at Kazo Secondary in January of 2016. 3. Pheona parents are both deceased. She came to us when she was 13 years old having never been able to go to school – she was abused by her Uncle. She successfully completed S-4 in Kabale last December. Pheonah wants to begin a diploma course in Hotel Management at YWCA in January of 2016. · Lilian completed her bachelor's degree in Mechanical Engineering this year. She is currently working as a Maintenance Engineer at Serena Hotel. · Her twin brother, Laban, will complete his medical degree (MD) the end of 2016 at Makere University Medical School in Kampala. He recently stated to me that he would like to go into research once he completes his studies. 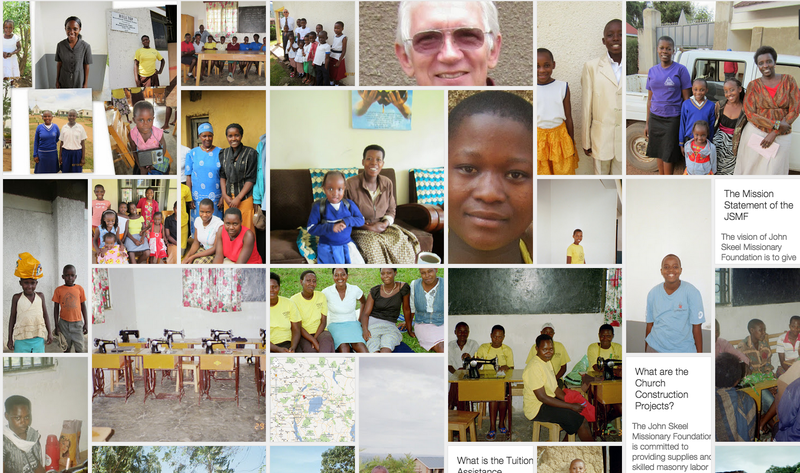 · Enorine is in the top 5% of her class at Sades Academy in Rushere. She told me that she wants to go into banking once she completes S-6 the end of 2016. · Enoth (Enorine's twin brother) and Alex will complete S-6 at Kazo Secondary at the end of this year (2015). · Bridget will begin S-1 in Kabale the beginning of next year (2016). · Kasheija will begin P-6 in Kabale the beginning of next year (2016). We have three basic programs. The family of Emmy is from the remote far western village of Rubaya near the border of Rwanda. The children that we have assisted are the younger siblings of Loyce – Immaculate, Enoch and Christine. All attend Rubaya Secondary school where Loyce teaches History and Geography. Emmy is a subsistence farmer. He and his brother share 10 acres where they plant food that they can eat. The family of Michael (church of Uganda Priest) and Patience (MSW with Compassion International) that live in the western border town of Kabale: They have three of their own children + currently 3 foster children – Pheonah – a hotel management intern; Bridget who will start Secondary School in January and Kasheija who will be promoted to P-6 with his sister, Shalome. Patience completed her MSW in Social Work in 2015. We currently have two students attending Kazo Secondary in Senior-6. They are Alex and Enoth. They will finish Secondary School (the equivalent to our High School) in December of this year. At Sades Academy in Rushere, Enoth's twin sister, Enorine will be starting S-6 in January of 2016. In the capitol, Kampala, we currently have two students at University level Lilian will receive her Bachelor of Mechanical Engineering this December -2015. Her twin brother, Laban, is in his 5th yr. of Medical School at Makere University. He plans to go into research when he finishes the end of next year. 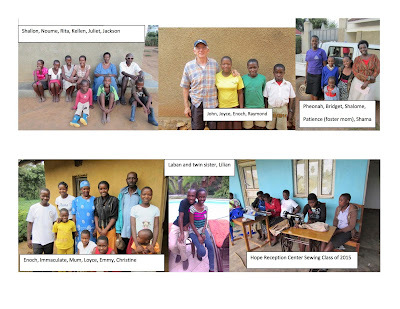 The family of Jackson from Kinoni has 10 children with all them in school. We are currently assisting 4 of the oldest girls with school fees and hostel fees while they are attending classes in Kampala. Two are in secondary school and two are attending classes in Hotel Management at YWCA. They all stay in the same flat in Kampala. Cleophus completed her two year diploma at St. Francis Tailoring School in Mbarara in December of 2014. She is our new intern instructor at Hope Reception Center. Currently there are 12 girls enrolled in the HRC – Sewing School Kabale. Nixon is our current sewing instructor. His class this year has grown to 18 students. We sent him to classes several years ago in Kabale to be our new instructor. We have been very happy with the progress that he has made in attracting new students. Both class room instructions are offered at no cost to the students. They meet five days a week from 9 AM to 4 PM. All of the student walk to class. · This year we built one more church (our 5th) in the area around Mt. Elgon, Eastern Kenya with the assistance of Pastor Mark Ndinyo in 2015. · Mark and his family moved to Woodstock, GA this past August so he can go to seminary to receive his Masters in Divinity here in the US. We, the board of directors wish to thank all of our faithful donors for their continued financial support and remembered prayers. - Edmund Burke (1729-1797) Irish philosopher.